Red Lens Flashlight Buying Guide & Why Should You Use It? ​When it comes to finding the right tactical flashlight for your needs, one of the most popular is those equipped with a red lens instead of a traditional clear lens for white light. But why are red lenses so popular and do they make a positive difference when using the flashlight? Why Use​ A Red Flashlight Lens? Is A Red Lens Flashlight Right for You? 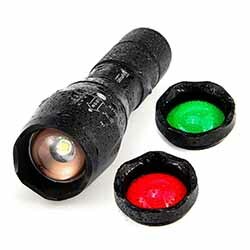 ​There are a few reasons why using a flashlight with red lens makes sense for your particular needs. In the military, different colored lenses have been tested and experimented with over the years to find the one that works under most conditions. ​Improve Night Vision: For those using night vision equipment, a red lens over the flashlight preserves the ability to see through the lens while still providing additional illumination. Using a traditional clear lens that allows for white light will often brighten areas too much for the night vision equipment to handle. Of all the colors in the spectrum, red seems to work the best when using night vision. ​You Can See through Red Flashlight! ​Lower Light Profile: It is actually a myth that using a red lens on a flashlight will not be picked up by others in the area. However, it will lower the light signature that is put out and make you harder to spot as compared to white light. For military operations, the red lens is quite common because it works well with night vision and makes the soldier less of a target. ​Signaling: Although this applies to other colors of lenses, using a red lens can help you visually signal to another party and let them know it is you and not the “enemy” or just a random reflection of light. This is another common use of red lenses. ​Admittedly, there is a lot of information on the internet that consists of opinion to the value of using a red lens on your tactical flashlight. For general use situations and in particular for emergency purposes of trying to get someone’s attention, a red lens will be a hindrance and not help for that type of signaling. 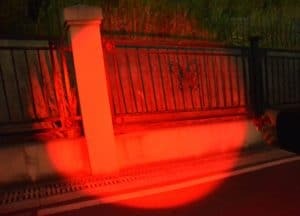 ​However, for those who do go out at night and want to keep their presence as little known as possible, a red lens on the flashlight may be the answer. 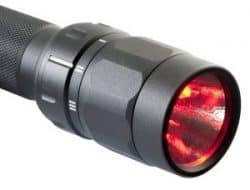 Whether you are engaged in military activities or hunting at night and want to draw less attention when using your flashlight, then a red lens might be right for your needs. ​Keep in mind its limitations and the expense of the additional red lens over a standard tactical flashlight. Plus, you’ll want an option of having a clear lens when you need to blind a potential attacker or get someone’s attention. 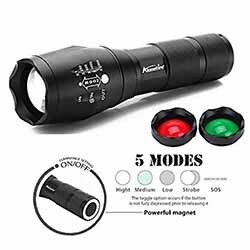 ​The UltraFire Tactical LED A100 is a light, low-priced red and green lens flashlight designed for indoor and outdoor use. It also offers several other features that make it an attractive purchase. ​The UltraFire Tactical LED A100 Flashlight is an exceptional bargain for all its attributes. The lightweight, yet durable aluminum casing and five different mode settings make it a good buy for its price. It’s not the best for self-defense, but it is quite good for carrying around in your vehicle, out in the woods, or when the power goes out. ​The powerful AloneFire T6 is a remarkable flashlight designed primarily for outdoor use but offers enough versatility to make it a potent emergency light. ​Overall, the AloneFire T6 is a highly versatile flashlight that is perfect for nearly every situation. The casing is crafted from aluminum and the features are easily accessible. From having an emergency light in your vehicle or home, traveling outdoors at night, or for self-defense, the T6 offers the brightness and versatility needed all for a small price. However, the failure to include a wall charger is curious, so you will need to pay more for that convenience. ​Designed primarily for indoors, the Evolva T20 offers several features, including an infrared light which can be quite useful outdoors. 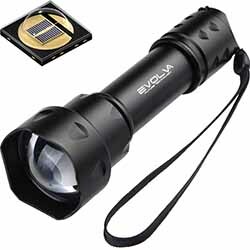 ​The Evolva T20 is a special flashlight that works like gangbusters. It provides a powerful, long-lasting beam that is perfect for being outdoors or when you need an emergency light around the home. One drawback is that it’s not waterproof which is troubling for outdoor use, but it is versatile enough to be well-suited for most occasions. Plus, it is well-priced and quite durable which is more than enough reason to purchase this flashlight. In the end, getting a tactical flashlight with red lens does offer a few advantages depending on its use. If you are using night vision equipment, then a red lens is preferable to a traditional flashlight that delivers white light. Otherwise, you may be better off with traditional tactical lights if you are not using night vision equipment.